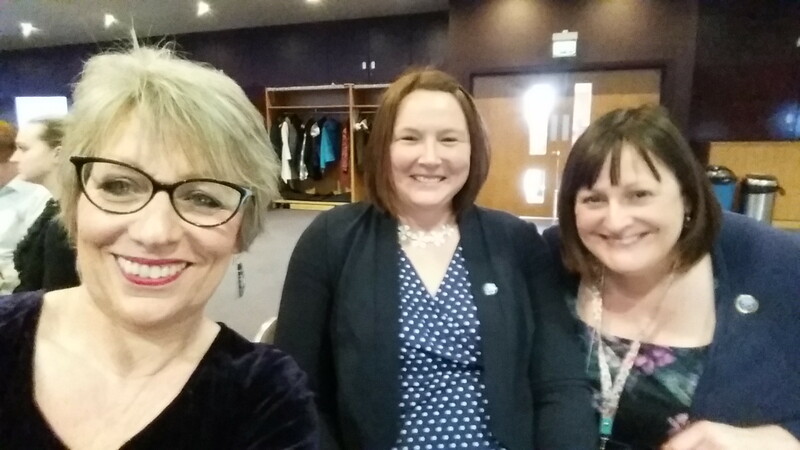 By the time you read this, I will have given what has been billed by my Twitter chum @PGTips42 at Bradford District Care Trust as a Social Media Master Class. In fact you would have to look hard to find someone who is less of a social media master than me. If they were paying me, the 60 attendees would by now have asked for their money back. Luckily, I am doing it for free. This gives me a chance to explore some recent thoughts with them and to visit the beautiful model village of Saltaire in West Yorkshire. The legacy of Sir Titus Salt could teach us a thing or two about philanthropic investment in social capital and infrastucture for the good of everyone, not just the richest. Back to social media. 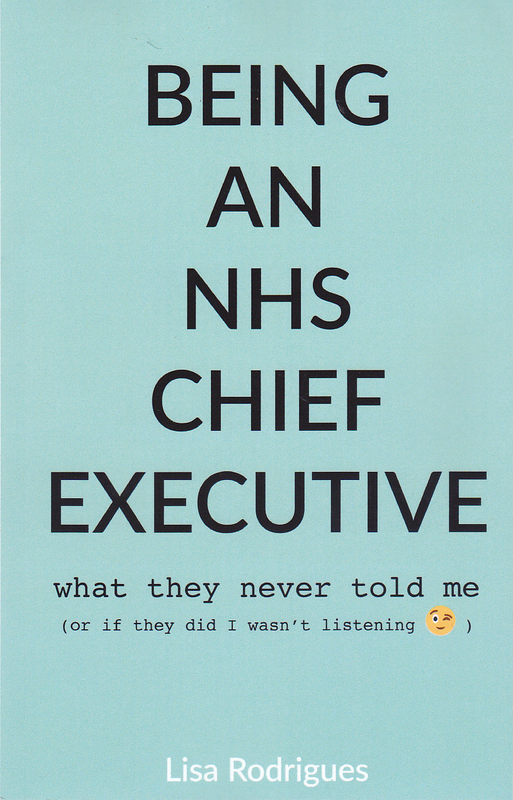 One of the promises I made to myself when I retired from the NHS was that I would accept speaking engagements only when they were about something that really interested me, and that I would never again use Powerpoint. I’ve stuck to this for 2 1/2 years and it has served me pretty well. I did think about breaking the second rule for this session, as some screen grabs from Facebook and Twitter would have been nice, especially if they included kittens. But I decided against it. Instead, I will have meandered through some personal insights, drawn from this blog and the references herein, and even better, found out what the attendees think. My personal approach to using social media is how I tend to approach most things – I jump in and have a go, ignore wise advice and instead work out the rules as I go along. This isn’t the wrong way, but nor is it the right way. It’s just my way. But however you choose to get started, putting yourself out there via social media is undoubtedly scary. It is important to take care. I do highly recommend this very well constructed article by Annie Cooper and Alison Inglehearn. It will help you stay safe. Once you have chosen your preferred social media platform – such as Facebook, Twitter, Instagram etc (and this can feel like a Betamax v VHS choice), here are an updated set of rules I shared in a previous blog that might help a social media novice get started. Listen twice at least twice much as you speak. Don’t rise to the bait or post when angry or under the influence of dis-inhibitors. Share opinions but remember they are only your opinions. Others are allowed to disagree! Where possible, stick to facts and values. As in face-to-face conversation, seek common ground. Don’t only talk to people you know you will agree with. Some people describe those who do as living in an echo-chamber. There ARE trolls out there. But not as many as you might be led to believe. Be kind, always – to yourself and to others. It is possible, and great fun, to crowd-source a seminar, as I have now done a few times. Yes, it takes more time than the usual approach. (And it doesn’t finish on the day. It is important to thank people properly who have made the effort to help you.) The benefits are the potential to engage many times more not only with your direct audience but also with others via social media. And to widen your own learning in ways you could not have imagined. Most of what you see here has been achieved with the help of my social media friends. Given my passion about mental health, I must mention the impact of social media, which can either be overlooked or understated, in my experience. I thank my friends for reminding that social media is only a very small part of the world. It can be a source of solace and support, as I have sometimes found. But it can also cut you off, if you let it. And it can be vicious, self-righteous and damaging. People can hide behind anonymity, so bad behaviour is invariably worse, goes more unchecked and can be more intrusive than in face-to-face interactions. I wrote this blog about Twitter in 2014 which you might find helpful. Blogging is not compulsory. If you like sharing thoughts in writing, you will probably enjoy blogging and learn to do it well. Like everything worthwhile, it takes practice. And if you don’t, you won’t. I would also mention that, however much you like the blog site you have chosen, unless someone (i.e. you and/or your readers) are paying for it, you and they ARE the product. The same applies to all social media platforms and indeed all publications, such as “free” newspapers. If we want original, independent writing to thrive, we MUST pay for books, journals, newspapers, even blog-sites. Otherwise it won’t be long before the only things available are products sponsored from a commercial or otherwise partisan perspective. And that is a very sinister prospect. Some people use social media platforms such as Twitter for swift repartee, and blog about more considered and complex thoughts. I would argue that blogging can help us to work out what we think. And that we can use Twitter and other chat sites for this too. After all, there is no point getting involved in conversations if we have already made up our minds about something. Here is a bit more about why I write a blog. Just to show that I have been thinking about social media for a while, here is something I wrote for the HSJ in 2012. This slide deck on the role of social media in health is the extraordinary Dr Helen Bevan, @HelenBevan on Twitter. 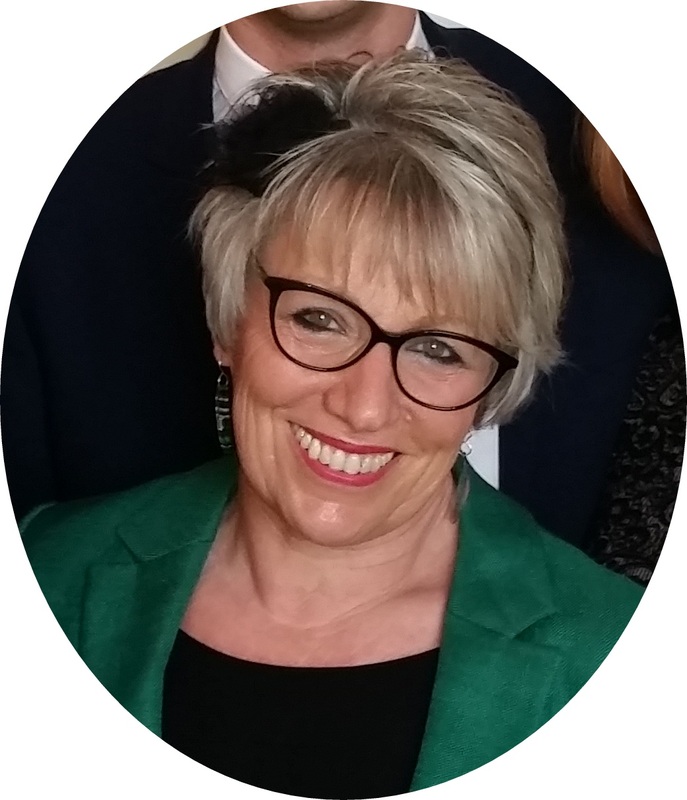 Helen is a genius in improvement methodology and practice as well as new ways of working, including using social media. And I thank another wonderful friend @AnnieCoops for introducing me to this lovely video poem about the social media imprint we leave behind us. Like all good things on social media, it will make you think really hard. Which is the best sort of thinking. Here are some of my new friends at Bradford District Care Trust. They were AMAZING!!! And given that I mentioned kittens, here is William to wish you all well for 2017. This week has been Mental Health Awareness Week. 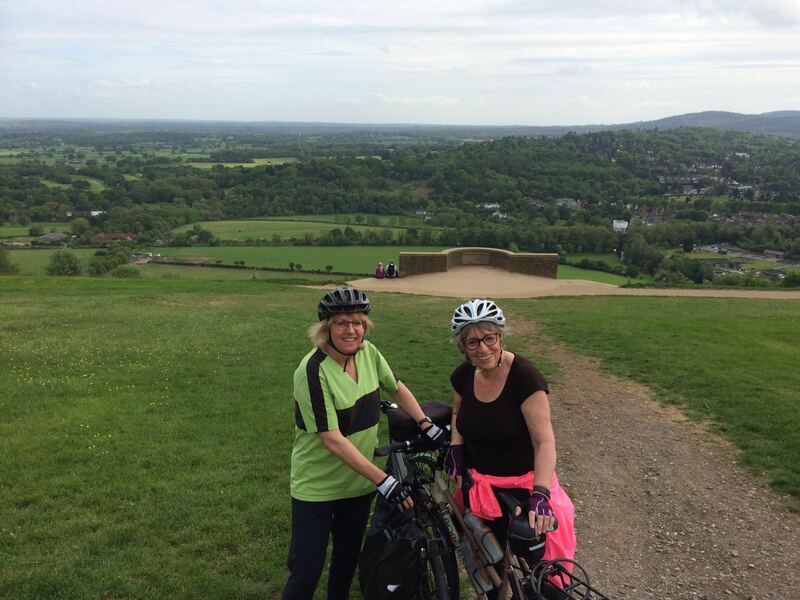 I’ve written three articles, visited a friend, given a talk, attended a party and been on a bike ride. There’s been some other more difficult stuff which I don’t feel able to write about just now. More anon. I wrote this piece about the loss of Sally Brampton through depression and what is assumed to have been suicide. Suicide casts a long, cold shadow. My heart goes out to all who have lost someone that way. And to all who have tried to keep them safe. There is sometimes talk of failure in such circumstances. I fully understand why. But it can be cruel and destructive to those left behind. It can affect the grieving process and have terrible repercussions. I decided a while ago to devote some of my time to being a volunteer in suicide prevention. This work can of course be distressing. But is so worthwhile. If more people were involved in understanding about suicide, it would improve compassion and more lives might be saved. Blame doesn’t save anyone. If anything, it can have the opposite effect. 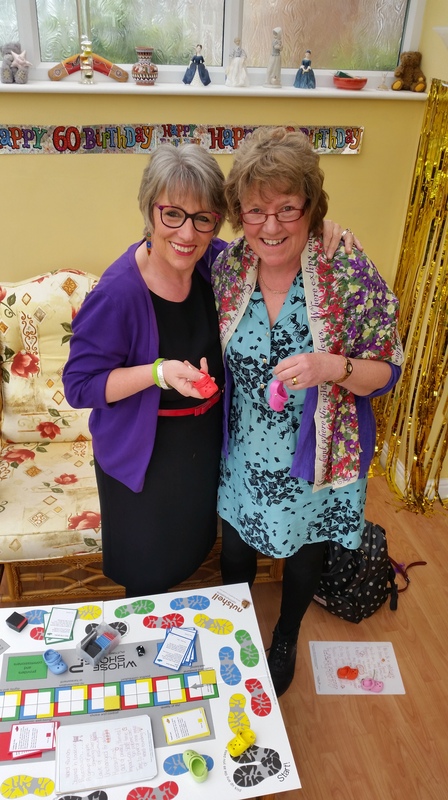 On Monday I popped up to Rugby to see the lovely Gill Phillips and learn more about the groundbreaking work she does through her company @WhoseShoes. Gill had a special birthday this week – now she’s nearly as old as me! I love the way that this entrepreneurial woman has started a new adventure. I hope I can support Gill to bring Whose Shoes to the world of mental health. Go us! Just Giving asked me to write this list of ideas to help people to manage their own mental health. It’s been fun watching the list grow throughout the week, and hearing comments from unlikely places about the tips. I just curated the list – none of them were invented by me. I try to follow them, not always successfully. And I wrote this piece called Serendipity for NHS Employers. It was also Equality and Human Rights week. It was serendipitous to bring two things together that matter very much to me but which I hadn’t realised before had so much in common. I’ve had some useful feedback. It has sparked conversations about how we can use Mary Seacole’s legacy to inspire young people not just to dream, but to work hard and not be deterred by setbacks from achieving their ambitions. One of my ambitions is to see the top of the NHS become less white and less male. Nothing against you guys, but as it says in my blog, the way things are now just isn’t representative. And having an unrepresentative leadership breeds alienation and resentment which has a negative impact on services. On Thursday afternoon I spoke at a Brighton Housing Trust Health and Wellbeing Service event (photo above). I was invited there to inspire the women with my experiences of being a high profile woman who is also open about my own mental illness. But to be honest, it was they who inspired me. I heard some stories I will never forget. I want everyone to know what we agreed, which is that people who live with mental illness have assets to share. Rather than deficits to avoid or accommodate. I’m going to be returning to this theme in the future. I was at the beautiful Black Cultural Archive in Brixton on Thursday evening at a comedy night with a purpose – to thank all the ambassadors and trustees who have spent 12 long years raising money for the Mary Seacole Statue. 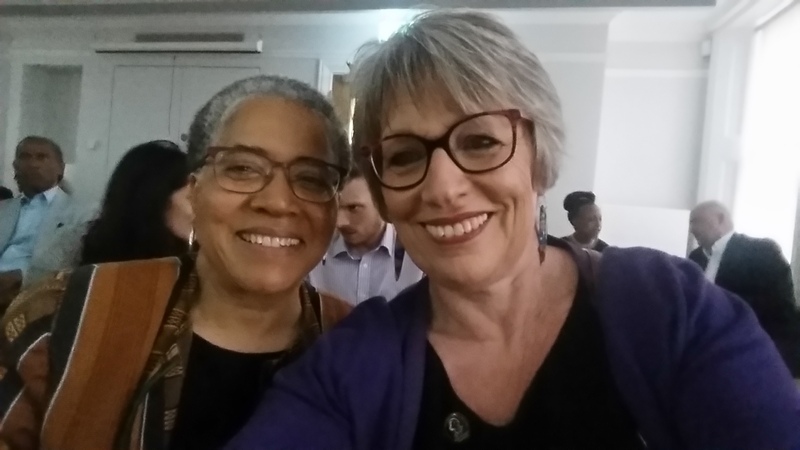 That’s me with our brilliant and indefatigable Vice Chair Professor Elizabeth Anionwu CBE. Mary’s statue goes up in six weeks – much more about this soon. It was nice that 12,500 people read my two recent blogs on the mental health angle of a current The Archers storyline. But it wasn’t all good. I am a sucker for positive reinforcement, including WordPress stats. And I doubt I will ever again get 4,500 views in a single day. And that’s the thing about maintaining one’s mental well-being if you are one of the 1:4 people like me for whom it is sometimes a struggle. I’ve been a bit down since those two blogs. I’ve questioned whether I’ve got anything interesting left to say. And yet I know I need to write about stuff to work out what I think. Here’s what I’m thinking about today. Someone said to me recently, with real sincerity, that the tide is turning on the stigma of mental illness. They said they thought that the battle had been won because people like me can stand up and say that we sometimes need help from mental health services. And not be judged. Because it doesn’t feel that way. Not to me, nor the friends I’ve made through social media and in real life. Especially not those who haven’t been as fortunate as me and are forced to grind out an existence on state benefits juggled with occasional paid work. The positives from such work are overshadowed by arcane, dis-empowering rules of which it is almost impossible not to fall foul. Nor does it feel that way to those who live in fear of losing their homes, or who haven’t even got a place to call home. Current government policy feels deeply discriminatory and the exact opposite of therapeutic for those already experiencing the potentially crippling challenges of mental illness. It doesn’t feel that the stigma has gone away for the people who can’t get the right mental health treatment, or even any treatment at all. As a wise person recently said, imagine telling the parents of a child with early stage cancer that they have to wait until things seriously deteriorate before they can see a specialist. And even then, the care will be rationed and probably not what is recommended. That’s the reality in many parts of the UK, for children and adults too. I heard a senior commissioner say the other day that they would love to invest more in mental health, but the evidence just isn’t strong enough (my italics). What planet are they living on?? True, spending on mental health research is woeful. But there is nonetheless masses of really good evidence about what works. And it starts with intervening early via properly funded local services delivered by highly trained, well-supported staff. What also doesn’t help reduce stigma is the almost constant service redesign and reconfiguration. Indeed, the billion pounds of “new” money announced by Jeremy Hunt after the Mental Health Taskforce Report was published is not, in fact, new at all. It has to be achieved through efficiency savings. I know from experience that such initiatives rarely achieve all that is promised. And they almost never take account of the collateral damage to staff well-being. Not to mention competitive tendering, which mental health services face at disproportionately greater levels than other parts of the NHS. Plus the drip-drip reduction in mental health funding and the erosion of national data collection so that it takes the skills of investigative journalists to uncover the ongoing cuts that have been made over the past 6 years despite government rhetoric about parity of esteem for mental health. And what adds further to the stigma is that the media rarely mention mental illness or mental health services except when something appears to have gone wrong. Where are the motivational stories like the ones about people who have “beaten” cancer? Even when no mistakes have been made, the finger of blame gets pointed. Imagine how this feels to staff who work in these services, being pilloried for doing a job that most people couldn’t begin to contemplate because they don’t have the skills, patience, courage and compassion needed to work in mental health. They should be lauded and supported, not ignored and criticised. So no, the stigma of mental illness is not a thing of the past. It is ugly, cruel, destructive and ever-present. Like racism, sexism and homophobia, it will never truly go away. We have to be vigilant. And we have to keep working at it. Despite the job I once did, it took me until I was 58 to get over my own self stigma and admit that I experienced clinical depression from time to time. Coming out about it was the hardest but also one of the best decisions I ever made. I take my hat off to others who have got to that point sooner than me. You are braver than anyone who hasn’t been there will ever know. Showing the world that people who experience mental illness have hopes and ideas and other wonderful human assets to share is the best way there is to make others want to join us and change the way things are. Writing about mental health and The Archers was fun. Writing this piece was harder but far more satisfying. I will try not to care how many people read it. Because the ones who do are the ones who matter. I love talking about mental health. What could matter more? 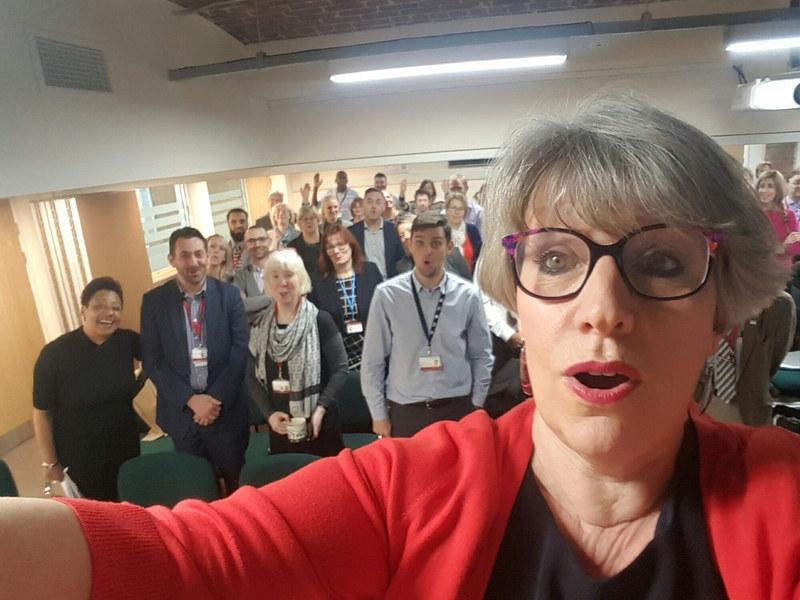 This blog is drawn from ideas I have developed (and squirreled) while thinking about well-being at work for a slot I did at the Health at Work Conference in Birmingham last week, and in advance of an NHS Employers webinar on staff well-being yesterday. I used an earlier version of this blog to give my talk, and I warmly thank everyone who contributed. Your questions and comments were wonderful and you will be able to see that i have made some changes because of them. And what an exciting day yesterday was. Because the Girl Guides Association announced their first mental health badge. It has been developed with the excellent charity Young Minds. It uses theories about emotional literacy and resilience to help young people take care of themselves and help others. If only they had done this 48 years ago was I was a Girl Guide. And wouldn’t it be great if such an approach could be rolled out across all schools and colleges and youth groups? What a brilliant start this would give young people facing the world. At the conference last week, we heard from companies large and small who are putting employee wellbeing front and centre of their investment strategies. And this isn’t because of any sense of duty or even kindness. They know that it pays. 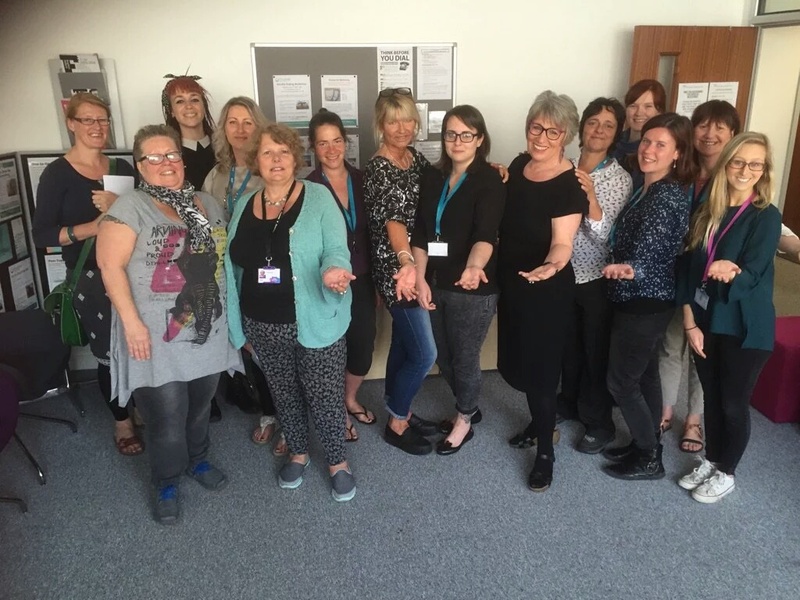 They want to know the best ways to help staff achieve optimum health and how best to work with employees who have physical or mental illnesses to manage their conditions and get back to work quickly and well. If we consider the NHS as one employer, it is the largest in Europe, many times bigger than even the largest multinationals at that conference. And yet we seem slow to follow suit. I say we…I don’t work for the NHS any more. But having done so over a period of 41 years, I feel deeply concerned for its staff. So I was very grateful to take part in the NHS Employers webinar. Well-being and resilience are the new buzzwords. They are being used everywhere. I like them. But I also have a few issues with them. If we aren’t careful, well-being strategies can feel as if they place responsibility on the individual. And I see well-being as a partnership between the individual, their employer, their co-workers and anyone else they choose to invite to help them achieve their optimum health. I like the Maudsley Learning model of mental health very much. It shows a series of steps and explains that we are all on a spectrum of mental wellness. I like the way it removes a sense of us and them. But there are nonetheless inherent dangers in such models. Unless you have felt the terrifying symptoms of psychosis, clinical depression, an eating disorder or any of the other hundreds of mental illnesses, you might think that mental ill-health is merely an extreme version of the distress that anyone might feel when something bad happens. Using well-intentioned euphemisms like mental distress, intended to reduce stigma, can add to the isolation felt by people who experience mental illness. It’s important to say that most people won’t ever experience mental illness, just as most people won’t ever experience cancer or diabetes. But 1:4 of us will. And we need skilled help from our employers if we are to go back to work at the right time and give of our best. The last time I was ill, I was lucky that I got the right help. Not everyone does. And that is why I do the work I do now, campaigning to improve things in the NHS and beyond for patients and staff. I shared two specific insights at NHS Employers webinar. The first is that we separate mental and physical health for laudable reasons but at our peril. Obesity might get more sympathy if it were treated as an eating disorder; the most effective treatments combine diet with psychological support, including CBT techniques. Exercise is known to increase endorphins and improve mental wellbeing as well as physical health. People with serious mental illnesses die on average at least 20 years too soon, mainly because of associated poor physical health. And there is an increasing evidence base that people with chronic physical conditions such as cancer, heart disease and strokes have a greater tendency to experience clinical depression. Which comes first doesn’t really matter. Employers should, in my view, use this knowledge of the inherent links between mind and body to devise their wellbeing strategies and make this explicit. Bringing the mind and the body back together needs to become the next Big Thing. And secondly, I am increasingly of the view that people who experience mental illness, who are open about it and learn to live well with it despite the massive challenges it poses, can become even better employees than those who don’t have these experiences. I’m talking about people like many of the friends I have met since I came out about my own depression. Such people show extraordinary resilience, compassion for themselves and others, patience, creativity and highly developed social skills that would be valuable in any workplace. They are truly amazing. I try not to have regrets. But one of mine is that it took me far too long to realise that my experience of mental illness could become an asset, if I let it. So now I’m trying to make up for lost time! I want to share links to my other blogs that I think might be helpful to anyone thinking about wellbeing at work. This one is about taking the plunge and talking about your own mental health, perhaps for the first time. This is my plea to be kinder about obesity, because what we are doing now simply isn’t working. This is about the things you can say and do to help a friend or colleague who is experiencing mental illness. And the things that really don’t help. 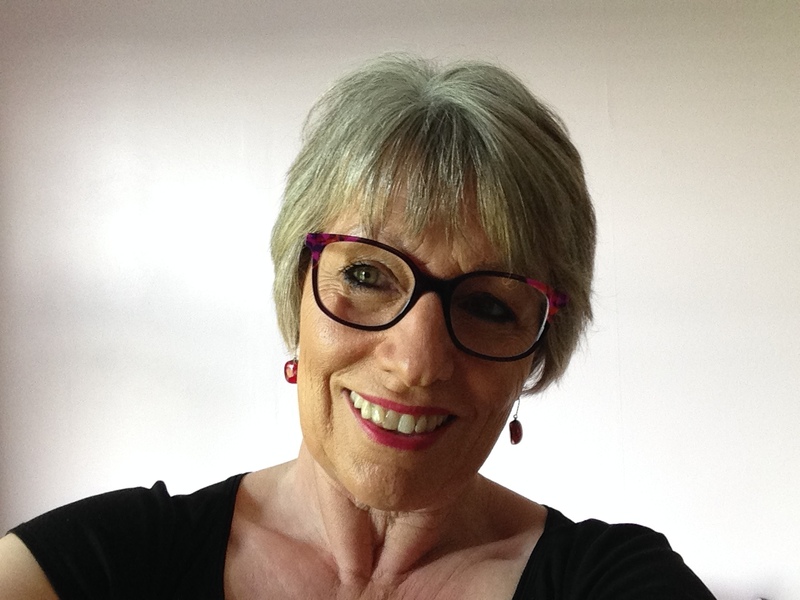 This is a blog in which I thank people who have helped me in my journey of self discovery – still very much a work in progress. And this is my Letter to You. Which you might want to suggest to someone who you think may be struggling. Life is hard for most employees these days. Working in the NHS holds particular challenges. Stress at work doesn’t have to make people ill. But it can. Employers can make a difference. And so can co-workers. Please take a moment to think about your colleagues, especially the ones who are having a tough time, seem a bit quieter than usual or not quite their usual selves. Ask them how they are. And really listen carefully to what they reply. 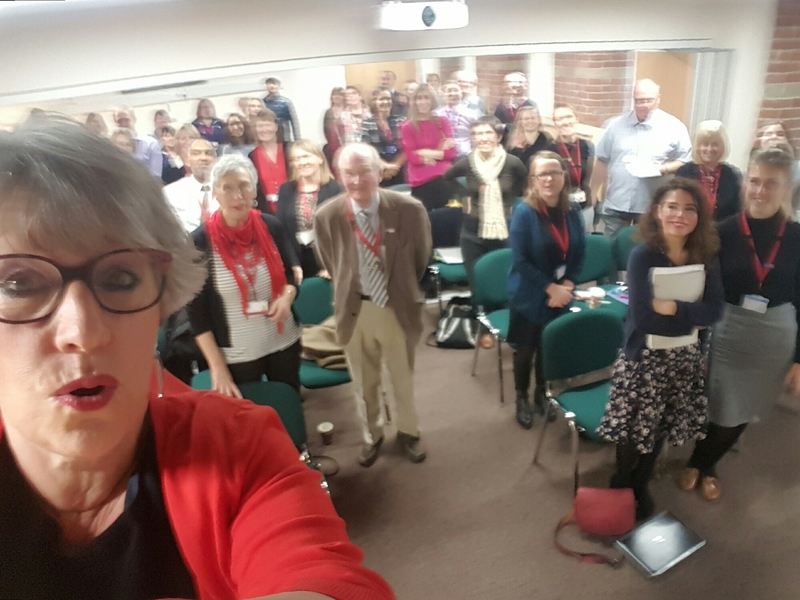 Last Thursday, 3 March 2016, I facilitated a couple of seminars at the East Midlands Leadership Academy social media conference. Two days before the seminars, I invited anyone who felt so inclined to help me prepare via Twitter and a blog. I then used an updated version of the blog I had initially written as my audio-visual aid for the seminars. It was my very own small action research social media project. Thank you to the 450 people who read the original blog, commented on it and/or joined the two seminars. I called the seminars Wishing and Hoping and Blogging and Tweeting, which hopefully gave attendees a hint that I’m no expert and that I take a don’t-wait-for-permission-but-ask-for-forgiveness approach to my own use of social media. You can see the first blog and the comments on my blogsite directly below this one. Thank you very much indeed to Zoe Bojelian, Liz O’Riordan, Chris Richmond, John Walsh, Phil Jewitt, Annie Cooper, EM, Natasha Usher, Sian Spencer-Little, Lloyd Davies, Linda, Vicki W and Laura Hailes for taking the time to comment on the blog. I apologise to Fenella Lemonsky, Gill Phillips and anyone else who tried to comment but were stymied by WordPress and/or their own social media platforms. I don’t know how these things work, but I know how annoying it is when they don’t. I also warmly thank everyone who helped share my requests to get involved or commented themselves via Twitter, including @bipolarblogger @hpiandycowper @davidgilbert45 @AgencyNurse @whoseshoes @jbmccrea @kirsti79 @andrew_davis @noshinakiani @carolinewild @LindsayHobbs51 @HubTube @OrganicLemon @LisaMillerVC @NHSE_PaulT @AlysColeKing @PeterMEnglish @HollowDave @MargoJMilne @endless_psych @JYoolz @QueerAndConcise @ethicConsult @allyC375 @HealthWKTD @ pgtips42 @LearnHospice @alisonleary1 @Lindawr45160138 @Lucy EMLA @LucyMorley1 @JennyTheM @PatientOpinion @DaniG34 @JOMWLever @emetalic @DanileOyayoyi @MConroy09 @GeorgeTruSATCGirl @AMKane87 @ImtiazGiriach @ElizabethJSays @DebElSayedd @GeorgeJulian @LyndsayShort1 @NickiH @bigronstevenson @wendynicholson @andrewbeee @rosgodson @wendyJNicholson @gremlin2C @mynameisAndyJ @sara_J_Brown @penny_thompson @jackiecassell @claudemmx2 @roz_davies @sweeternigel @nonnazoo74 @garethpresch @anyadei @beckyOT @claudia_writes @spencer_sian Sincere apologies to anyone I have misspelt or missed out. Most of all, I want to thank the two sets of participants at the seminars. When I asked them where they were on a scale of 1 = social media virgin – 10 = social media warrior/maven, the lowest score anyone gave was a 4, and I think that person was being overly modest. There were lots of 7s and 8s and quite a few 9s. Given I would put myself at 6.5, it felt rather like a master-class in reverse. Which is the story of my life. I’ve drawn my personal learning points from all of this into a list below, and included some references for you. It is possible, and great fun, to crowd-source a seminar, even a podium address in the way I’ve just done. Yes, it takes more time than the usual approach. And it doesn’t finish on the day. It is important to thank people properly who have made the effort to help you. I hope I have paid enough attention to this. The benefits are the potential to engage many times more not only with your direct audience but also with others via social media. And to widen your own learning in ways you could not have imagined. My personal approach to using social media is how I tend to approach most new things – I jump in and have a go, and work out the rules as I go along. This isn’t the wrong way, but nor is it the right way. It’s just my way. However you choose to get started, putting yourself out there is undoubtedly scary. It is important to take care. If you are in a high profile role and/or a health care practitioner, this very well constructed article by Annie Cooper and Alison Inglehearn is just great. It will help you stay safe. My session last week was about using social media as an individual who may (or may not) happen to work for an organisation. NHS social media guru Joe McCrea (@jbmccrea on Twitter) gave a fascinating presentation at the same conference about the use of social media by NHS organisations. He is about to publish a seriously interesting report – please do keep an eye out for it on his wesbite. The mental well-being side of social media can be either overlooked or understated, in my experience. I thank several folk for reminding me to remind others to be aware that social media is only a very small part of the world. It can be a source of solace and support, as I have often found. But it can also be vicious, mean, self-righteous and damaging. And because people can hide behind anonymity, bad behaviour is invariably worse, goes more unchecked and can be more intrusive than in face-to-face interactions. I wrote this blog about Twitter last year. I think what I said then still holds true. Lots of people want to share their ideas by blogging but have yet to get started, and are keen to choose a good blog-site. I can’t recommend any specific sites because I’ve only used WordPress. I do like it, but like all software, it has downsides. I would just remind you that, however much you like the site you have chosen, unless you are paying for it, you and your readers ARE the product. If we want independent writing to thrive, we MUST somehow pay for books, journals, newspapers and maybe even blog-sites. Otherwise it won’t be long before the only things available to read are the ones that carry adverts or are sponsored from a commercial or otherwise partisan perspective. Quite a few people have pointed out the difference between posting comments on social media sites like Twitter, and blogging. Which is that the former is for swift repartee, and the latter is for more considered thoughts. I agree. But I would also argue that blogging helps us to work out what we think. And we can use Twitter and other chat sites for this too. After all, there is no point getting involved in conversations if we have already made up our minds about something. Here is a bit more about why I blog. This slide deck on the role of social media in health is from my extraordinary friend Dr Helen Bevan (@HelenBevan on Twitter – if you don’t know who to follow, follow Helen). Helen is a genius in new ways of thinking, including social media. She presented this at a social media get-together event at the beginning of last week. I’m sad I couldn’t go, because it looked highly informative and fun. Finally, I thank Annie Cooper for sharing this lovely video poem about the social media imprint we leave behind us. Like all good things on social media, I promise it will make you think really hard. Which is the best sort of thinking.